Facility signage communicates important safety information to visitors, patients and staff. Hospitals, clinics, nursing homes and more use facility signage to improve workplace and patient safety. Healthcare organizations use facility signage to identify fire extinguisher locations, first aid supplies, hazmat response equipment and more. They also identify no smoking areas, cell phone restrictions, gun restrictions and other facility guidelines. 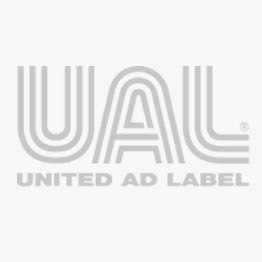 United Ad Label facility signage is durable and laminated to withstand cleanings. And, the window label feature makes the sign visible to those on the outside. Plus, a liner slit on the back of the label makes application easy. NO GUNS, 4" x 4"
NO SMOKING, 4" x 4"